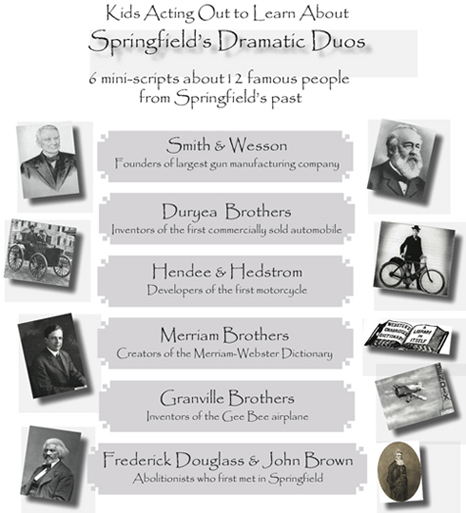 Understanding the products, activities, and people who made Springfield great is a special way to educate youth and adults about our history. And what better way is there than through the arts? The plays have a light touch, and each has been reviewed by an historian. Stage a play that relates to an event or holiday. Work the script(s) into your curricula, or just to have some fun. Script-in-hand readings are fine - no need to memorize. Costuming & small props (hat, walking stick, etc.) can add to the show. Actors can be: students, teachers, volunteers, local celebrities. These links will open GOOGLE DOCUMENTS. On the top left side of the screen you will find a drop-down menu, FILE, that has options for downloading and printing. Sponsored by In the Spotlight, Inc. with assistance from the Springfield School Volunteers. a local agency supported by the Massachusetts Cultural Council.